Sixteen year old Mattie Gokey has big dreams but little hope of seeing them come true. Desperate for money, she takes a job at the Glenmore, where hotel guest Grace Brown asks her to burn a bundle of secret letters. Bu when Grace's drowned body is fished from the lake, Mattie discovers the letters reveal the grim truth behind a murder. Set in 1906 against the backdrop of the murder that inspired Theodore Dreiser's An American Tragedy, this astonishing novel weaves romance, history and a murder mystery into something moving, real and wholly original. A Northern Light is classified as a young adult book. Because it's classified as such, I wasn't quite keen to read it at first until I kinda chide myself to stop being so choosy as I was rejecting books left right and centre without really much good valid reason. I kinda felt it might have something to deliver and I am glad to share that I was absolutely correct in this case. 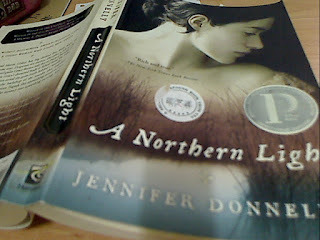 A Northern Light is a wonderful read. The story is about Mattie who is sixteen and who loves to read and loves to learn. However, her mum's death has left a big gap in her family's life and with a couple of younger siblings to look after and a whole lot of other responsibilities expected of her around her dad's farm, it's a challenge for her. In order to study needs money too and there's non to spare and Mattie starts working in the hotel to help out with finances around the home and for herself. Grace Brown was a guest who asked Mattie to get rid of some letters but Mattie forgot to do so in her business and Grace Brown was found dead. While the death of Brown wasn't the focus of the book, it was both haunting and inspiring Mattie in her struggle in her sixteen year old existance. Grace Brown is not fictional. She is real and if you google her, you will be able to find stories of her death. That was one uniqueness of A Northern Light other than good writing and story development by the author. Even if you are not a young adult, you will appreciate this book too.